Posted on January 23rd, 2019 in Dee Why. Although the 2.05 m high tide arrives at 1045, it already looked pretty fat when I grabbed the snaps at 0800. Skies were gloomy and the occasional rumble of thunder signaled an approaching band of showers. I couldn’t see anyone in the water at Dee Why nor up the beach to No Mans. 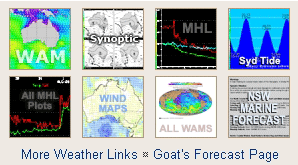 The wind was light and down at North Head the anomometer was seeing 5-8 kts from the NNE. Out at sea the MHL buoy recorded 1.1 metres of nearly 12-second swell from the SSE (158°). So, there might be the occasional waist high thing elsewhere…maybe… Ocean is on 21C and the Bureau says we can expect a high of 29C. We’ll see what the Goat says tomorrow, but from my reading of the models, we’re likely to be stuck in this very small to near flat surf regime into February. Wish it wasn’t so friends, but there you have it. At least we’re not putting up with relentless +40C temps like those in our country’s interior. A high pressure system lies over the Tasman Sea, while a trough stretches from central Australia through western New South Wales. This pattern will bring northerly winds to most coastal areas this morning. A trough is currently bringing a fresh to strong southerly change to the southern waters and is expected to extend to the central waters during the day today. This trough will weaken on Thursday as the Tasman high asserts its dominance and winds will tend to the north again during Friday. Another trough and associated southerly change will enter the southern coastal waters early Saturday morning and will extend to central waters during the day. Northerly 15 to 20 knots shifting southerly 15 to 25 knots in the early afternoon. 1 to 2 metres, decreasing below 1.5 metres during the morning, then increasing to 1 to 2 metres during the afternoon. South to southwesterly 15 to 20 knots, reaching up to 25 knots offshore early in the morning. Winds tending south to southeasterly below 10 knots during the day. 1.5 to 2 metres, decreasing to 1 to 1.5 metres around midday. Variable about 10 knots becoming northeasterly 15 to 25 knots during the day. Below 1 metre, increasing to 1 to 1.5 metres during the afternoon or evening. Southerly 1 to 1.5 metres, tending southeasterly 1 to 1.5 metres during the afternoon. Posted on January 22nd, 2019 in Dee Why. A big 2.07 m high tide peaking just before 1000 and less than a metre of SSE swell are combining to produce very tiny to flat conditions at Dee Why. Ocean is 21C according to Beachwatch, so at least it should be nice for a dip even if there is no reason to take a board along. Should be sunny all day as we look to a 30C high this afternoon. Surf outlook is still pretty dire. The swell prediction models are uniformly glum, with the most hopeful showing a slight uptick tomorrow into the knee high range. From next weekend and into next week, the consensus looks to be knee to waist give or take, but no real signs of anything more significant. A high pressure system lies over the Tasman Sea, while a trough stretches from central Australia through western New South Wales. This pattern will bring northerly winds to most coastal areas today. A trough is forecast to bring a moderate southerly change to the southern waters early Wednesday and is expected to extend to the central waters during the day. This trough will weaken on Thursday as the Tasman high asserts its dominance and winds will tend to the north again during Friday. North to northeasterly 10 to 15 knots, reaching up to 25 knots offshore in the late evening. Northerly 15 to 20 knots, reaching up to 25 knots offshore early in the morning. Winds shifting southerly in the middle of the day. Southerly 15 to 20 knots turning southeasterly during the afternoon. Southerly around 1 metre, increasing to 1 to 1.5 metres during the afternoon. Posted on January 21st, 2019 in Dee Why. A 2.2 metre high tide at 0900 combined with less than a metre of short period south bump meant no real prospect of a surfable wave at Dee Why – or anywhere else in Sydney. Throw in grey skies and a good chance of the odd shower this morning and it looks like an excellent day to be getting on with the non-surfing part of your life. Some of the models are pointing to a very slight increase into the (potentially) surfable range on Wednesday and most of them project a more hopeful, but sitll modest uptick for the weekend, particularly on Sunday. Have a top old Monday! A high pressure system lies over the Tasman Sea, while a trough stretches from central Australia through western New South Wales. This pattern will bring northerly winds to most coastal areas today and Tuesday. A trough is forecast to bring a fairly weak southerly change to southern and central waters mid-week, which should quickly decay as the Tasman high asserts its dominance. Easterly 10 to 15 knots turning northeasterly in the middle of the day. Cloudy. 60% chance of showers. The chance of a thunderstorm this morning. North to northeasterly 15 to 20 knots. North to northeasterly 15 to 20 knots becoming variable about 10 knots during the day then becoming south to southwesterly 10 to 15 knots during the evening. Posted on January 20th, 2019 in Dee Why. Not much going on at Dee Why on a cloudy Sunday morning. There were a few folks on rescue boards training up the beach from the club, but I didn’t see anyone else in the water. Wind was light SSW 5-7 kts early, but should go around to the SE and pick up 10-15 kts in the afternoon. The Sydney MHL buoy is off the air, but looking at the numbers from stations north and south of us, it’s probably around a metre at 7-8 seconds from the south. Tide hit a swampy 1.93 m high as I was writing this at 0815. We’re headed to a high along the coast of 26C. It should stay cloudy and there’s a 20% chance of the odd light shower. Water is 21C and Beachwatch says all ocean beaches are likely to be clean. Outlook is for surf conditions to remain at the current low ebb until Wednesday when the models suggest we might see something in the knee to waist high range (as opposed to the current ankle to knee high stuff). Beyond that, the outlook is not terribly hopeful. The general trends are pointing to ankle to knee short period dribble through to February… on your behalf I hope that’s wrong! A high pressure system over the Tasman Sea is weakening, while a trough on the northern New South Wales coast has stalled and is beginning to decay. A new high will shift from the Bight to the Tasman Sea over the next day or so, bringing a return to northerly winds in most coastal areas during Monday and Tuesday. The next trough and southerly change are expected to affect southern and central waters mid-week. South to southeasterly 10 to 15 knots tending east to southeasterly in the afternoon. Easterly 10 to 15 knots becoming variable about 10 knots in the middle of the day then northeasterly 10 to 15 knots in the evening. Posted on January 19th, 2019 in At large. Posted on January 18th, 2019 in Dee Why. A dull old morning at Dee Why for Friday. No real sign of surfable waves either. According to the MNL data from 0600, it was 1.6 metres from the ESE at 6 seconds apart. So not a surprise the beach looks so blah. Not that it matters all that much, but as I was writing this a little before 0900, wind was ENE at 7-9 kts just down the coast at North Head. Going to a top of 33C today and ocean is a refreshing – if windblown later – 21C. A high pressure system over the Tasman Sea is directing moderate to fresh east to northeasterly winds along most of the New South Wales Waters. A weak trough and associated southerly wind change is expected to move through the southern waters later today. Another stronger trough is expected to move through the southern half of the Waters Saturday morning, then extend to the Mid North Coast later Saturday, before stalling and weakening on Sunday. East to northeasterly winds are expected throughout by Monday evening as another high pressure system becomes established in the Tasman Sea. Northerly 20 to 30 knots shifting southerly before dawn then decreasing to 15 to 25 knots in the middle of the day. Northeasterly 1 to 1.5 metres, increasing to 1 to 2 metres during the morning, then decreasing to around 1 metre during the afternoon. Below 0.5 metres, tending southeast to southwesterly 1 to 1.5 metres during the morning. South to southeasterly 10 to 15 knots turning easterly during the afternoon. Southerly 1 to 1.5 metres, decreasing to around 1 metre during the afternoon. Posted on January 17th, 2019 in Goat's Forecast. Posted on January 17th, 2019 in Dee Why. Humid and warm start to the day at Dee Why. Waves are in the knee high range on the rare sets along the beach. The point wasn’t doing anything and there were only a couple of people in the water. As of 0730 the wind was 4-5 kts from the NNE at North Head. The MHL data from 0500 was showing 1.5 m of sub-7 sec wind bump from the north and SSE. Tide is dropping to a 0.58 m low at 1210. The wind should kick up later and be in the 15-25 kt range from the NE by this afternoon. The morning overcast should give way to a partly cloudy afternoon as we head to a high of 32C. Water has crept up to 21C according to Beachwatch. Waves aren’t likely to improve today but maybe tomorrow we’ll get a little uptick – if the more optimistic models have it right. Have a good Thursday and stay happy! A high pressure system over the Tasman Sea is directing east to northeasterly winds along most of the New South Wales Waters. Northeasterly winds will freshen along the central and northern parts of the coast during the afternoon. 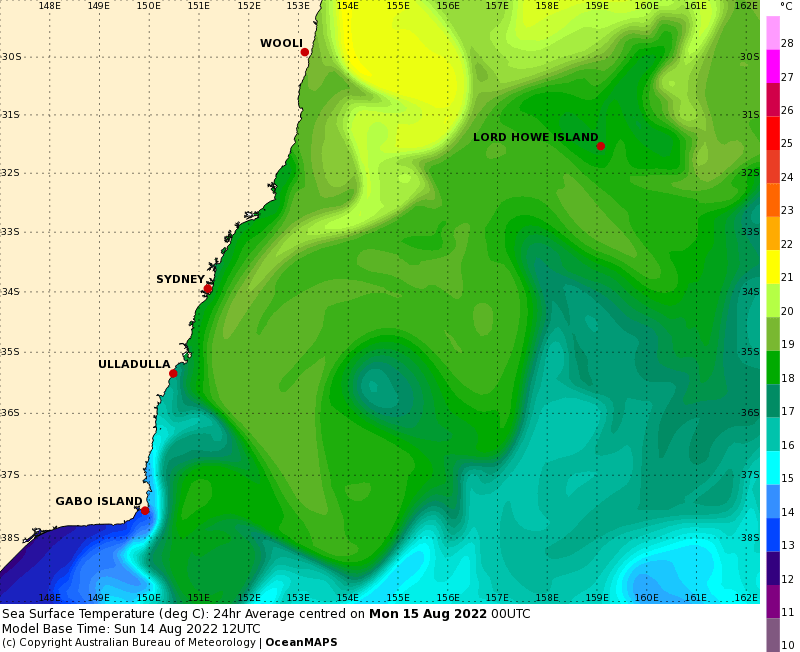 A trough and associated southerly change is expected to move through the southern half of the Waters Saturday morning, then extend to the Mid North Coast later Saturday, before stalling and weakening on Sunday. East to northeasterly winds are expected throughout by Monday evening as another high pressure system becomes established in the Tasman Sea. Northeasterly 15 to 25 knots, reaching up to 30 knots offshore in the late evening. North to northeasterly 20 to 30 knots becoming northeasterly 15 to 25 knots in the middle of the day then tending southeast to southwesterly 20 to 30 knots in the late evening. Northwest to northeasterly 15 to 20 knots tending southerly 15 to 25 knots during the morning. Posted on January 16th, 2019 in Dee Why. The point simulating a wave, but no takers and a moment later it faded away. Again we have little lines coming into the Dee Why end of the beach. As of 0720 when I took the pictures, there was just the faintest NE zephyr whispering over the lumpy surface. It’ll come up to 15-25 kts later as we head to a high of 31C along the beaches. Tide is currently dropping to a 0.67 low at 1100. The afternoon high of 1.28 m arrives at 1655. The 0500 MHL data showed 1.9 m of 6.7 second SE dribble along with a dusting of equally short period NE chop. Ocean temp is still on 20C according to Beachwatch. The ECM model predicts no real change through the coming 7 days, but the Wavewatch model shows some hope for some NE windswell late Friday.into early Saturday morning. But then it too shows a return to near flatness as we get into the weekend – and beyond. Gotta hang in there surfers! At least we’re another day closer to the next proper swell. Go well with your Wednesday one and all. A slow-moving high pressure system over the Tasman Sea is directing east to northeasterly winds along most of the New South Wales coast. Northeasterly winds will be fresh along the central parts of the coast during the afternoon. Very little change is expected in this pattern until the weekend, when a trough is likely to bring a southerly change on Saturday. East to southeasterly 10 to 15 knots inshore tending northeasterly 15 to 25 knots offshore. Winds tending northeasterly during the afternoon and reaching up to 30 knots offshore in the late evening. Northeasterly 1.5 to 2 metres. Posted on January 15th, 2019 in Dee Why. Line come into Dee Why but fades before it does anything. Little NE looking bumps drifting weakly into Dee Why this morning. The MHL buoy was showing 1.6 m from 130° at 6-seconds apart. As experienced surfers will know, that means really gutless and tiny. I didn’t see anybody trying to catch a wave from the point up to No Mans. Tide was dropping to the 0.7 m low at 0945. Water is on 20C according to Beachwatch. There was 10-13 kts of NNE wind blowing by 0830 this morning under sunny skies and with the air temperature rising toward the 30C high. The daytime highs won’t be getting below the 30C mark until Sunday according to the Bureau. I looked up Sydney’s average maximum for January and weatherzone says it’s 26 for the highs and 18 for the lows. So far we’re on 28.7 and 20.8 – with less than half the historical average rainfall. Last year broke all records when January averaged 29.8 and 21.6. The models are predicting a small uptick tomorrow to Friday, but we’re probably only talking waist high at magnet spots for the mainly NE bump. A slow-moving high pressure system over the Tasman Sea is directing east to northeasterly winds along most of the New South Wales coast. Very little change is expected in this pattern until the weekend, when a trough is likely to bring a southerly change. Northeasterly 15 to 25 knots, reaching up to 30 knots in the evening. 1 to 1.5 metres, increasing to 2 to 2.5 metres during the afternoon. Northeasterly 15 to 20 knots, reaching up to 30 knots offshore early in the morning. Northeasterly 1 to 1.5 metres increasing to 1.5 to 2 metres around midday. East to northeasterly 1 to 1.5 metres, decreasing below 1 metre during the afternoon.